Accueil Produits Bande originale La bande originale de “Maléfique”. La bande originale de “Maléfique”. Sortie : 27 mai 2014. 1. Maleficent Suite – 6:39. 2. Welcome To The Moors – 1:05. 3. 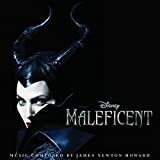 Maleficent Flies – 4:40. 4. Battle Of The Moors – 4:59. 5. Three Peasant Women – 1:05. 6. Go Away – 2:26. 7. Aurora And The Fawn – 2:29. 8. The Christening – 5:31. 9. Prince Phillip – 2:29. 10. The Spindle’s Power – 4:36. 11. You Could Live Here Now – 2:27. 12. Path Of Destruction – 1:48. 13. Aurora In Faerieland – 4:41. 14. The Wall Defends Itself – 1:06. 15. The Curse Won’t Reverse – 1:21. 16. Are You Maleficent ? – 2:11. 17. The Army Dances – 1:28. 18. Phillip’s Kiss – 2:21. 19. The Iron Gauntlet – 1:35. 20. True Love’s Kiss – 2:33. 21. Maleficent Is Captured – 7:42. 22. The Queen Of Faerieland – 3:25. 23. Once Upon A Dream (par Lana Del Rey) – 3:20.